Add a Little Pop with Color! Are you apprehensive about the thought of painting your walls with some COLOR? You’re not alone! I consult with lots of clients that love the interiors they see in magazines, but then are reeling with the hundreds of color choices when they hit the paint store. Will it be too bold? Not the right shade? Will my attempt at taupe end up looking like Clearasil? Yikes! I love color on the walls, and in every room of the house. Many people think that the best backdrop for displaying artwork is a white wall, but that couldn’t be further from the truth! Color on the walls really richens whatever is against it, so if you want to make your interiors more elegant, rich or dramatic, then add some color! Even the most subtle of colors can have a big impact. Pretty bland with white walls! I’ve lived in my house for 3 years, and was fortunate that the previous owners had put some nice, neutral colors throughout most of the home. The kitchen, however, was DRAB. 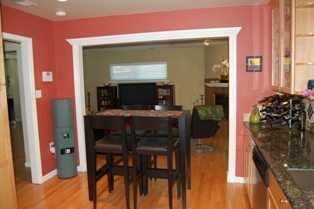 I have a lovely kitchen, with maple cabinets and dark granite counter tops, and we added the oak flooring when we moved in. But, it still lacked something to make it POP. Well, sometimes you just gotta jump in and do it! 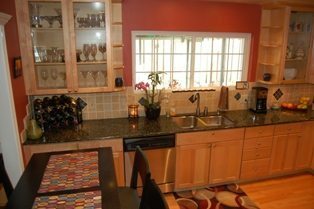 I decided that THIS was the weekend I was going to take my kitchen from drab to fab. 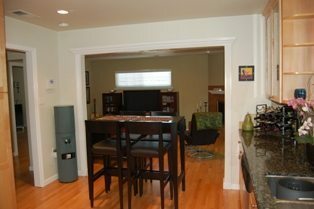 I only have three small wall areas, but it sure did make a big difference! Because I have such limited wall space, I went with a strong color, and it didn’t overpower the room. I’m in love with this color from Benjamin Moore, and it’s just what I’ve been envisioning for my kitchen. Now I can’t wait to tackle more rooms in my house! I’d love to hear your feedback on this latest project, and please check out my other blog posts! I get great satisfaction from helping other people with their design and decorating dilemmas, so feel free to throw your questions my way! Love the terra cotta color. It’s so scary to put color on the walls. Thankfully the “world” has people like you who can show us the way. The color really makes all of your furniture and decorations stand out more. Just gorgeous and lush! Now the trick is how to get your clients to be as brave as you and to trust that the color will be beautiful and to GO FOR IT! Looks so beautiful! Inspires me to think about some color in my home! Although I think that I will definitely give you a call to consult on that! Kathy, I completely agree with you about the importance of color. Color makes rooms pop. I bought my home new, so all the walls were white. I kept them white for almost 10 years, kind of liking the pristine feel. But then everything changed when I went to a friend’s house and fell in love with her colorful walls. I used her color expert to help me figure out my strategy. I am thrilled with the results. Color makes everything warmer and more lively. And you’re right. It’s scary. It really helped me to work with an expert like you. I wish I had known you at the time! You speak my language when you talk of adding color to your home’s walls! There is not a white wall anywhere in my home. The right colors–which you are fabulous at selecting for any home–add warmth and personality to rooms. In my business, homes on the market that have color tend to show better in photos and virtual tours. Usually, they also attract many more buyers and ultimately offers a little faster (and sometimes even a little higher price) than homes with plain white (or what I call, “Nava-NO” [Navajo] white walls. People respond better to color in general. I highly recommend seeking the advice of Kathy before you bring home the wrong hues! I’m with you, Dawn! Though I’m not a Realtor, I’ve been in my share of homes too, and everything in the home looks so much better against a backdrop of color. It was while touring homes to buy that my husband decided he liked color better than Navo-NO white! :o) Thanks so much for the hat’s-off, and back at ya! Wow, what a great color choice for your kitchen! That pop of color certainly livens it up and is so warm and inviting. What a difference paint can make! We’re looking forward to having you consult us on color choices for our soon-to-be new home. You have such a great eye for this! Can’t wait to see your kitchen in-person. Thanks, Laura! I too am looking forward to seeing your new home! Such exciting times, and the possibilities are endless! :o) Thanks for commenting! The room looks amazing! It looks totally different. I agree with the other gals. Color rocks! I have color in every room. I love it! That looks amazing Kathy! I always have a hard time deciding on color. It makes such a difference. I don’t do design because all shades of brown to me are brown, and I’d usually ask what’s the problem with white? Your before/after picture really drove the point home (no pun intended.) Very cool. Thanks, Massimo! It’s really nice to have a male perspective on color. My husband also used to say “What’s wrong with white walls?”, and still does, actually. Though now he does enjoy having the color around, so is beginning to see the light. :o) Thanks for commenting! I love what the color does for the kitchen! What a difference! I’m all about color on the walls. I’m with Dawn – no white walls in my house. I LOVE that you used your own home as the perfect example! Although the initial paint was crisp and fresh, the new color is so vivacious and dramatic, especially when offset with the white crown molding (it is crown molding, right?) I love the change – it’s like you’re in a whole new place! We can all use a little more “pop” in our homes and lives! Thanks for reading my blog, Irene, and I really appreciate your nice comments! Yes, Kathy, you did indeed add a “pop!” using the red instead of white. Something I need to consider when I get around to adding a fresh coat to my place!